The UNL Robotics Club is reaching out to all the creators and innovative minds throughout the university to be part of the 2019 ASABE International Robotics Design Competition. The club will be holding a general meeting on Thursday, Feb. 7 at 6 p.m. in the Scott Engineering Center (SEC) Room 318. The purpose of this meeting is to provide a brief introduction about our organization to new members, go over the rules of the competition, divide into groups and start the design process. UNLRC is a student organization that was founded in 2017 by a team of robotic enthusiasts who have been competing at the ASABE international robotics competition for the past three years. We are looking to expand our team and recruit like-minded students who would like to get involved in the design and assembling of robots. Besides participating in competitions, we educate students of different levels about robotics, provide networking opportunities for students and hold social events. 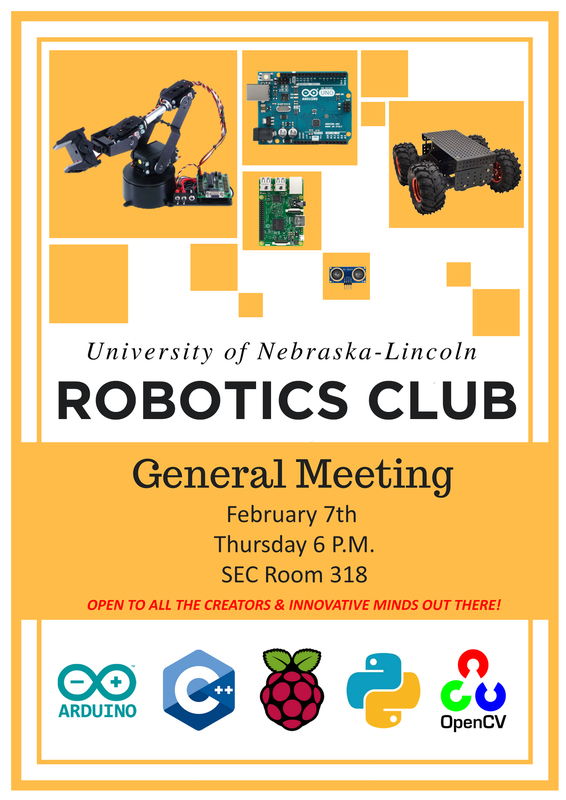 If you are interested in designing and building robots or mentoring others in Robotics, join us for this meeting on Thursday (2/7) at 6:00 p.m. in SEC 318. We are looking forward to seeing you.